Emergent management of torticollis can pose a challenge to the emergency physician owing to the fact that the condition can be acute or chronic, congenital or acquired, and idiopathic or secondary to trauma or disease. Moreover, the onset of torticollis can occur at any age. In addition, laboratory studies are not particularly helpful and are dependent on underlying disorder, although they are useful if infection is suspected. In prehospital treatment of acute torticollis, ensure a patent airway and perform cervical spine immobilization/precautions for patients with a history of trauma. 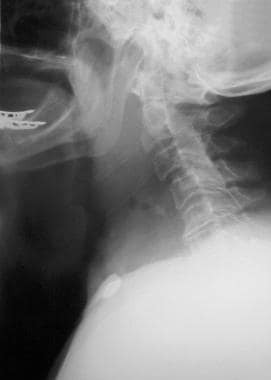 Soft-tissue neck radiograph demonstrates retropharyngeal abscess appearing as torticollis. Emergency department physicians should not diagnose idiopathic spasmodic torticollis if the patient has acute torticollis; consider other causes. Unusual cervical disk herniation or bony subluxation, on occasion, causes acute wryneck or torticollis. Patients with acute traumatic torticollis should have immediate cervical spine immobilization before further evaluation. Patients with respiratory compromise, stridor, or drooling should have emergent evaluation and management. Emergent diagnoses of retropharyngeal abscess, epiglottitis, and spinal epidural hematomas should always be considered. Treatment of torticollis is generally supportive and includes analgesics, benzodiazepines, anticholinergics, heat, massage, and stretching exercises. Most cases of torticollis, including congenital muscular torticollis resolve spontaneously. Reversible causes of torticollis should be identified and treated accordingly. Appropriate antibiotics should be given for infectious causes. Drug-induced torticollis is treated with diphenhydramine, benztropine, or benzodiazepines. Treatment of atlantoaxial subluxation depends on severity and duration and ranges from simple analgesia to cervical traction and immobilization to surgery. [6, 7] Antireflux therapy is indicated for children with Sandifer syndrome. Emergent specialist consultation is necessary for life-threatening diagnoses, including retropharyngeal abscess, epiglottitis, spinal epidural abscesses and hematomas, severe cervical fractures, and dislocations. Appropriate follow-up depends on the underlying disease process. Infants with congenital muscular torticollis should be monitored at 2- to 4-week intervals. Refer most patients with prolonged symptoms suggestive of idiopathic spasmodic torticollis to a neurologist for follow-up. Fixed deformities in children may require surgical referral. Drugs of choice for dystonic reactions secondary to medication include diphenhydramine, benztropine, and benzodiazepines. Lee YT, Park JW, Lim M, Yoon KJ, Kim YB, et al. A Clinical Comparative Study of Ultrasound-Normal Versus Ultrasound-Abnormal Congenital Muscular Torticollis. PM R. 2015 Aug 7. [Medline]. Kim JW, Kim SH, Yim SY. Quantitative analysis of magnetic resonance imaging of the neck and its usefulness in management of congenital muscular torticollis. Ann Rehabil Med. 2015 Apr. 39 (2):294-302. [Medline]. Hasegawa J, Tateda M, Hidaka H, Sagai S, Nakanome A, Katagiri K. Retropharyngeal abscess complicated with torticollis: case report and review of the literature. Tohoku J Exp Med. 2007 Sep. 213(1):99-104. [Medline]. Harries PG. Retropharyngeal abscess and acute torticollis. J Laryngol Otol. 1997 Dec. 111(12):1183-5. [Medline]. Nichter S. A Clinical Algorithm for Early Identification and Intervention of Cervical Muscular Torticollis. Clin Pediatr (Phila). 2015 Aug 24. [Medline]. Sobolewski BA, Mittiga MR, Reed JL. Atlantoaxial rotary subluxation after minor trauma. Pediatr Emerg Care. 2008 Dec. 24(12):852-6. [Medline]. Tonomura Y, Kataoka H, Sugie K, Hirabayashi H, Nakase H, Ueno S. Atlantoaxial rotatory subluxation associated with cervical dystonia. Spine (Phila Pa 1976). 2007 Sep 1. 32(19):E561-4. [Medline]. Costa J, Espirito-Santo C, Borges A, et al. Botulinum toxin type B for cervical dystonia. Cochrane Database Syst Rev. 2005 Jan 25. CD004315. [Medline]. Denislic M, Pirtosek Z, Vodusek DB, Zidar J, Meh D. Botulinum toxin in the treatment of neurological disorders. Ann N Y Acad Sci. 1994 Mar 9. 710:76-87. [Medline]. Truong D, Duane DD, Jankovic J, Singer C, Seeberger LC, Comella CL, et al. Efficacy and safety of botulinum type A toxin (Dysport) in cervical dystonia: results of the first US randomized, double-blind, placebo-controlled study. Mov Disord. 2005 Jul. 20(7):783-91. [Medline]. A 69-year-old woman presents with torticollis and a fever.